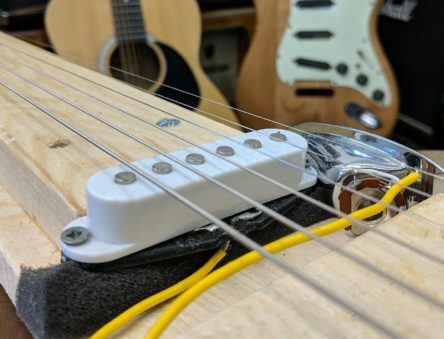 Build a working instrument using reclaimed and upcycled materials. If you’ve ever dreamed of making your own musical instrument, lapsteel guitars are a great place to start. 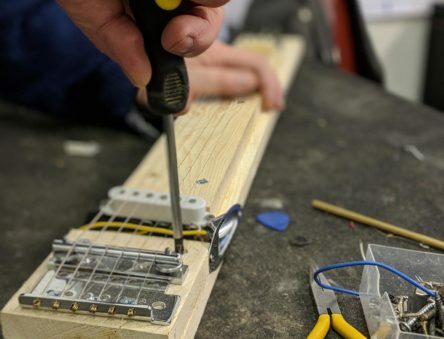 During this one-day practical course you will build a simple guitar to take away with you, based mainly on reclaimed materials. 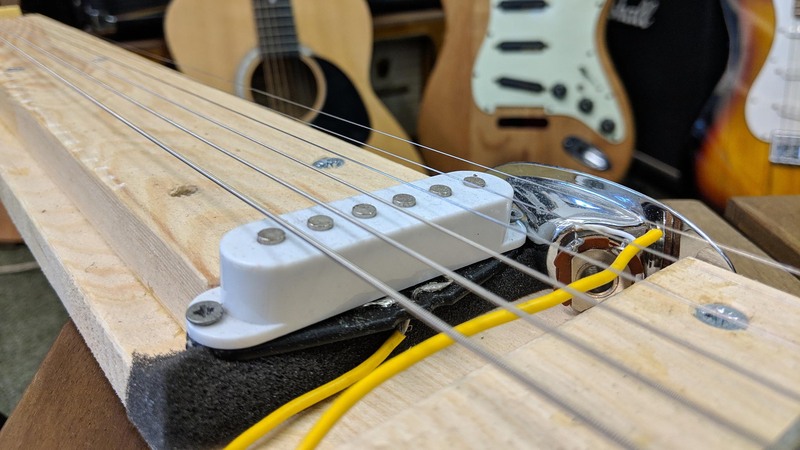 Build a working electric six-string lap steel guitar using on re-purposed wood and other materials. 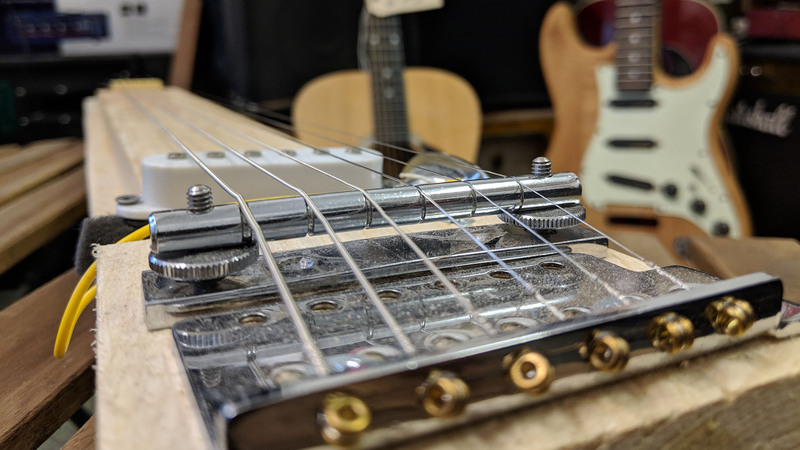 Designed for open tuning and playing with a slide or ‘steel’ (a metal bar placed on the strings to shorten the vibrating length and the source of its name), a lapsteel guitar is an ideal way to start making music or to build on your existing music making. To ensure you leave with a working instrument after only one day, we work very simple design, but the guitar will be constructed in a way that makes further upgrades, both technical and cosmetic, relatively easy and not wasteful of the work and materials you’ve already put into your creation. The course requires the use of basic hand tools, typically a hand saw, hand drill, screwdriver, rasp and sandpaper. There will be some gluing with water based wood glues but no soldering by the participants. The skills and experience gained during this course will be easily transferable and useful in other construction and repair projects. The wood that forms the core of the project will be salvaged, re-purposed or offcuts. Other parts, where possible and practical, will be used items salvaged from instruments that are beyond economic repair, functional parts that have been replaced to modify other instruments or re-purposed items modified for a new use. As part of the course, participants will be challenged to explore how items destined to be discarded can re-used, re-purposed or re-made, once again skills that will be useful in future projects and repairs. The course begins with a basic introduction to the nature of stringed instruments and how they create sound and modify its pitch. 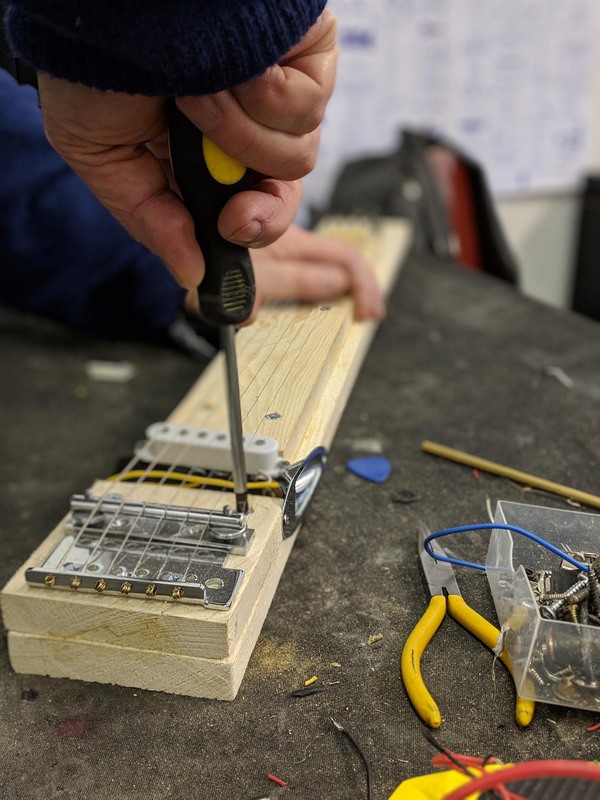 Following further detail on the design considerations specific to a lapsteel guitar, materials will be selected and, after a safety briefing on the use of the tools involved, construction will begin. The course ends with discussion on possible modifications and improvements and finally an opportunity to tune and play your new instrument. What is a lap steel guitar? Also called steel guitars, Hawaiian guitars or slide guitars they get their name from the ‘steel’ used to play them and the fact they are commonly played in the player’s lap while seated. 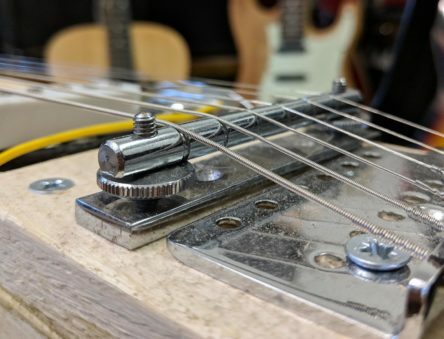 The ‘steel’ in question is a bar used to press against the strings and shorten the vibrating length (and thus raise the pitch of the sound), unlike a traditional guitar where this is achieved by pressing the strings against a fretboard. 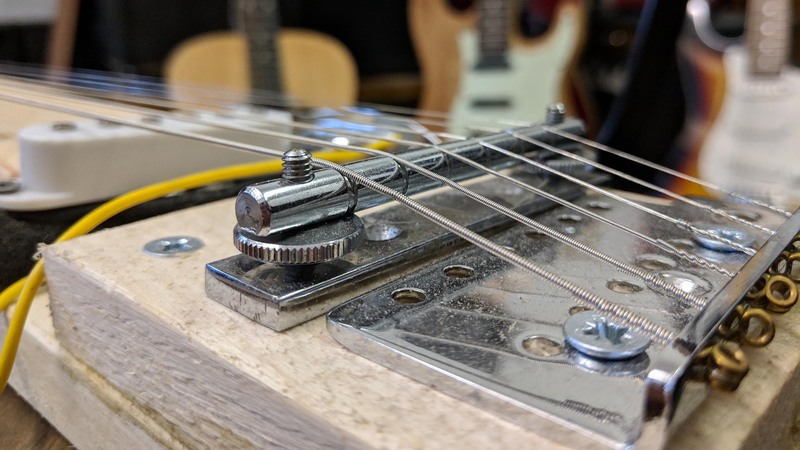 The strings are typically tuned to an ‘open chord’ such that each marked position on the fret board also plays a complete chord, meaning they can be played easily without having to learn traditional chord shapes. 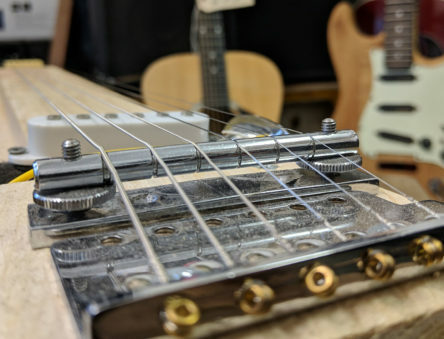 In common with other electric guitars, an electric lapsteel uses a magnetic pickup to produce the sound and so requires a method of amplification to be heard clearly.